Got Ears? Large size STO Pocket Pouch is the perfect carry pouch for your custom ear plugs, earbuds or in-ear earphones. The "squeeze to open" pouch is generously sized to easily accommodate your full shell custom earplugs, even with a neck strap attached. The case is made of durable, pliable plastic and opens with one hand for maximum convenience. The top snaps shut for maximum protection. Blue with orange "Got Ears?" logo. Available with your custom imprinted logo in quantities starting at just 250 pieces. Got Ears? 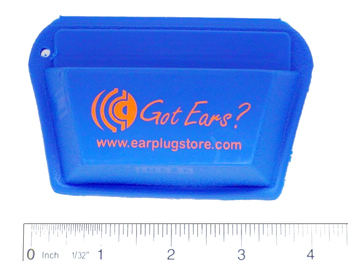 Large size STO Pocket Pouch is the perfect carry pouch for custom ear plugs, earbuds, or in-ear earphones. Order 250 pouches or more, each with your custom imprint. Special Offer large size squeeze-to-open ear plug and earphone carry pouch is black with a green JanSport logo imprint and comes with a FREE pair of Moldex PuraFit ear plugs. Got Ears? STO Custom Ear Plug and Earphone Pocket Pouch - Large5AlinaNovember 4, 2013Now, I only bought these to contain foam ear plugs at home. They hold about 10-12 pairs, I think. I think it might be good for travel. It is made out of a flexible material so it will not crack like the hard plastic ones. Also, if you sit on it or sit with it in your pocket I do not think it will hurt you. Now, please do note my thinks in this second paragraph. This second paragraph is based on speculation.